This is the current craze in my organization. Every member of staff is expected to send in his/her to in before a particular time daily. It has clearly increased individual as well as overall organizational effectiveness right from the day we started it. If you often struggle with staying on task, one way of combating this is by making lists. This article lists 7 things to remember about to-do lists. I know you’ve heard time and time again that you need to make lists. Here’s why it’s important to have a to do list. 1. It will help you to remember what you have to do today. Because it is documented, it becomes a reference tool and one hardly forgets what one is expected to do in the course of the day. 2. A to do list keeps you on task. Sometimes you get distracted by things such as forums, games, or chatting when you’re supposed to be finishing a project. One surefire way to combat that is to keep that to do list in front of you to serve as a gentle reminder before you go to that non business related/personal forum and spend hours reading the posts. 3. When you complete the items on your to do list you feel a sense of accomplishment. I don’t know about you, but I get a warm and fuzzy feeling when I can tick items off of the to-do list. Even when I have completed a “small” task it makes me feel good to know that there’s one less thing that I have to do. 4. A to do list should be recorded somewhere. It doesn’t count if the list exists in your head. You are guaranteed to forget something. Write it down, put it on your pda, use outlook, do whatever you have to do to get your to do list recorded. 5. A to do list is never set in stone. It’s just a guide for the day, week, month or year. You should always allow room for the unexpected to happen. You could get sick or there could be a dire emergency with one of your clients. You may have to work overtime on your job. You could get stuck in traffic. Always allow a cushion for these sort of things. 6. Your to do list should be realistic. If you work a full time job and are running a business, don’t put too many things on your daily to do list or you’ll feel discouraged when you don’t get all of the things accomplished on your list. 7. Make sure to include some time for fun in your to-do list. You should always schedule at least one hour of “me time” on your to do list. This could be your time to exercise, read or write in your journal/blog. It’s important to have down time so you don’t get stressed out. These are just a few ways to manage your time better. I hope you find them useful especially at this time of the year that you’re full of energy and revving to go as far as achieving your goals is concerned. Associations are so powerful. I am a product of associations which i’ve been involved with over the years. I’ve met with people who started out with wrong associations but by conscious endeavour, took their future in their hands and changed their circle of influence by changing their friends. A man can extrapolate where his life is going by merely looking at the people he constantly spends time with. An association one gets involved with without one’s choice is the family to which one is born and raised; and it goes a long way in determining one’s core personality. I was raised by strict parents, but it paid off. Within my immediate family, I had my elder sister whose life modelled what I unconsciously followed, we attended the same primary, secondary and University; we shared our victories, triumphs, failures and challenges. Our friendship affected my way of thinking and so influenced my choice of friends as I grew up. Adigun, Foluso Ilevbare and Gbemi Olaniyan. You ladies made my stay in Pharmacy school enjoyable. I also have some friends who mean so much to me – the Ogunfayos, Mogajis and Asaolus; you are real friends. I appreciate you. I’ve been opportuned to be associated with people who have challenged me to improve myself, to be dissatisfied with the status quo; Chief among them is my Sweetheart, lover, husband, father of my children and best friend, Adeolu; He’s been my friend since I was in Secondary School, he has played the greatest human role in my life. He listened, he smiled, he believed in me when I didn’t even know our friendship was going to be ‘upgraded’. He took and still takes my friends as his own. He’s got such a contagious, not forceful influence on anyone he’s associated with. 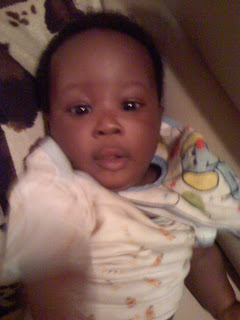 He’s the youngest, cutest and finest boy in the Akinyemi family. 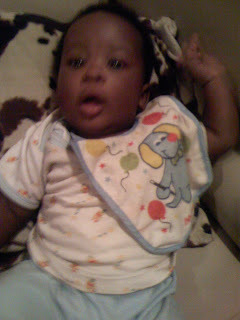 Born on October 1, 2007, his birth is a testimony. We prayed for him to come and God celebrated his coming to the earth. I pray that this new year, God will answer your prayers with resounding testimonies. It’s indeed important to follow one’s passion. Late last year, my parents came over to Lagos for a wedding and as usual, I had a “gisting” session with my Dad. I asked him questions about his work and he went ahead to tell me about his “latest love – farming”, he had recently made some hundreds of thousands of naira on farming within a short while. In order to give us a background, my Dad is a Medical Doctor, a Specialist Pediatrician who has been practicing for well over 30 years. He’s been really committed to it over the years and has gotten several awards, locally and nationally. He has also been running his own private practice for over 20 years and it’s obvious he’s very good in Medicine. His hospital is located in his home town and most of the work he does is humanitarian, everybody knows and claims to be related to him, so he doesn’t get to make much money from Medical practice. However, he has always loved farming but didn’t visualize possibilities of making it big in it, now, he sees the possibilities, but he’s in his sixties, and I’m sure he would be thinking, “if only I had blown this bigger much earlier”. I was reminded again of a lesson I’d learnt before which I’ll like to share with all. Knowing your passion is one thing; following it early is another. Looking back now, I can say he had always loved farming; he has a small poultry, a snailry, a plantain, banana and cocoa plantation, all these have never been for commercial purposes, he enjoyed doing them, it was obvious anytime he talked about it; his face lit anytime he spoke about farming; only recently did he think of employing people to run it for commercial purposes.